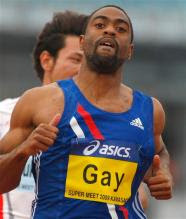 KAWASAKI, Japan — Tyson Gay ran a slow 10.13 seconds Wednesday to win the men's 100 meters at the Super Track and Field meet. "I didn't get the time I wanted," Gay said. "They said it was a positive wind but it felt more like a headwind because I felt the wind blowing in my face. I don't know if it was a swirl or crosswind." The American had equaled the second-fastest time for the 100 on Sunday in Shanghai, posting a time of 9.69 seconds to match Usain Bolt's then-world record at last year's Beijing Olympics. Bolt has since beaten that mark, running 9.58 at last month's world championships in Berlin. Gay was second in 9.71. The race is available for viewing below. On Wednesday, Allyson Felix of the United States won the women's 100 with a time of 11.22. "I didn't know what to expect because it's been about two months since I ran the 100," Felix said. "I was a bit rusty and was going through the motions a bit." Reese Hoffa won the men's shot put with a top throw of 20.21 meters, edging American teammate Dan Taylor, whose best was 19.87 meters. Felix Sanchez of the Dominican Republic, the 2004 Olympic champion, won the men's 400 hurdles in 48.91. Sanchez is coming off a left foot injury and Wednesday's win was his first since 2007. "This year has been difficult because my rhythm has been off, but I'm starting to find my form," Sanchez said. "I'm getting my confidence back and, hopefully, I can build on this.